Columbia College Chicago Theatre Department faculty member Ann Boyd and Susan Imus, Chair of Columbia College Chicago’s Department of Creative Arts Therapies, are collaborating on a presentation at the North American Drama Therapy Association‘s 2015 Central Region Conference on May 2 and 3. 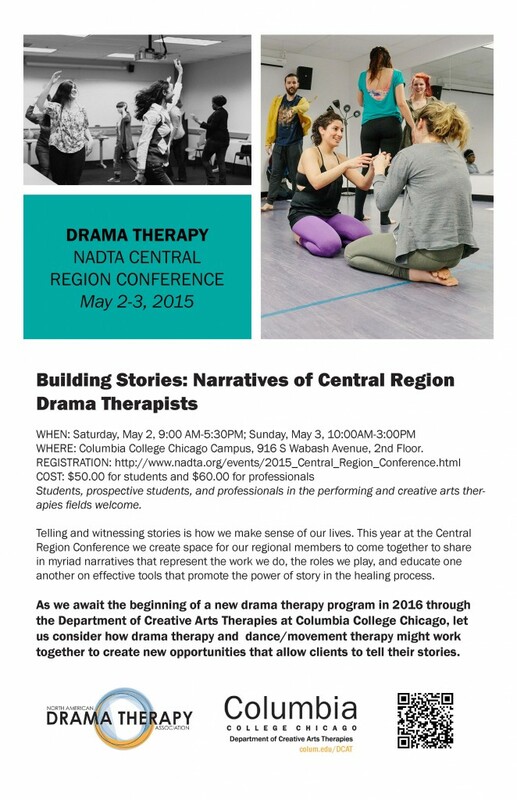 The conference, whose theme is “Building Stories: Narratives of Central Region Drama Therapists,” takes place at Columbia College and is co-sponsored by Columbia’s Creative Arts Therapies Department. Imus and Boyd’s presentation, “Therapy and the Therapeutic in Relationship to Creative Practice,” will take place on Saturday, May 2, 1:30-3 PM at 916 S. Wabash, room 214. Participants in this program will investigate what is therapeutic and what is therapy through creative exploration of a personal moment of loss, witnessing a story- and movement-based performance by Boyd followed by a discussion. Imus will frame the conversation around how dance and drama fit into the scope of therapeutic practice and performance. 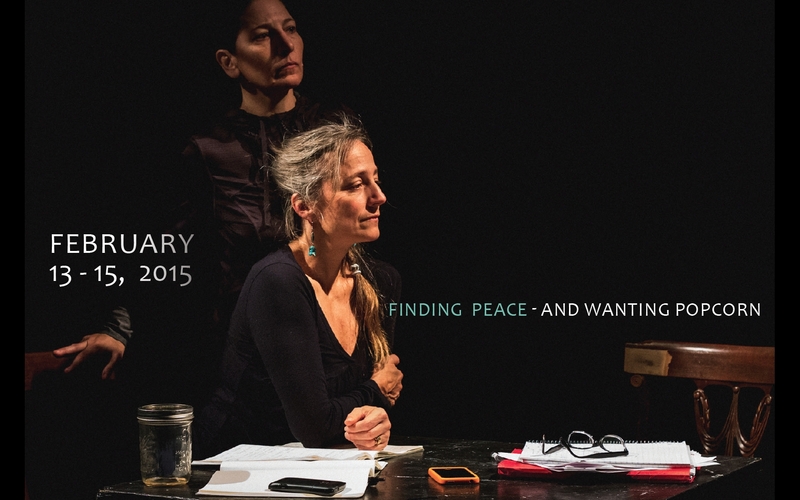 Boyd’s solo performance piece, Grief: A Work in Progress–previously performed as part of an evening of solo performance, “Finding Peace–And Wanting Popcorn” at Links Hall at Constellation in February–attempts to make sense of the hole left in the universe when her mother died. In dialogue with memory, Simone de Beauvoir, image and sound, Boyd is caught between a dream, and the reality of the moment, as she shapes a new truth for herself. “Grief: A Work in Progress began as a way of processing the loss of my mother,” says Boyd. 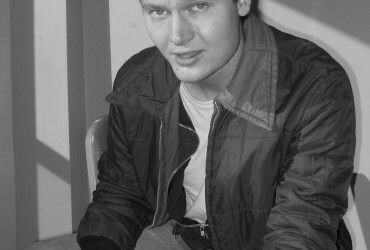 “At the time I felt the absence of any structure–cultural, religious, social, personal–to move through the sorrow. So I turned to what I know and practice, art making. The work began with 80 short ‘chapters’ to parallel the 80 years my mother lived. From the beginning I wrote the work as a performance, but was not sure I would feel the need to embody it, but as time went on it felt clear that this very private experience was one that might resonate with others and could be a kind of offering for audiences. . . .
Boyd teaches courses in body movement and devised theatre at the Columbia College Theatre Department and has developed the department’s innovative freshman-level, interdisciplinary Theatre Foundation Course. Her professional credits in Chicago range from solo performances at Links Hall directing movement for productions at Steppenwolf and Court theatres. Imus is a board certified dance/movement therapist, licensed clinical professional counselor, and certified movement analyst as well as a performer, educator, program developer, and consultant. As chair of the Department of Creative Arts Therapies at Columbia College Chicago, she has overseen the department’s growth from one program to five. 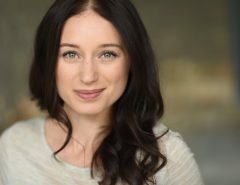 She and her team have been collaborating with local drama therapists to create a new graduate program in Drama Therapy & Counseling scheduled to start in Fall 2016. Drama Therapy & Counseling students will learn to apply theatre arts into the culturally informed practice of counseling psychology. The Drama Therapy & Counseling program will complement the department’s successful Dance/Movement Therapy & Counseling Master of Arts program, which interweaves the disciplines of dance and therapy to prepare students for work as counselors who use dance/movement as a modality for change and healing in a variety of clinical settings, including schools, hospitals, out-patient programs, nursing homes, community centers, rehabilitation and correctional facilities. For more information on the Drama Therapy & Counseling MA program at Columbia College Chicago, email bbrownholtz@colum.edu, call 312-369-7697, or visit online at www.colum.edu/dcat. The Department of Creative Arts Therapies offers undergraduate and graduate coursework in Performing Arts Therapies, Counseling Psychology, Arts in Healthcare and Movement Studies. In addition, it offers an Arts in Healthcare Minor that trains undergraduate students to bring their artistic discipline into healthcare settings for therapeutic, educational and recreational purposes. This minor is offered to students currently enrolled in a Major program in Art + Design, Photography, Theatre, Music, Dance, or Creative Writing at Columbia College, and provides education to those students interested in a unique niche for creating, exhibiting, and/or performing their art in a healthcare environment. 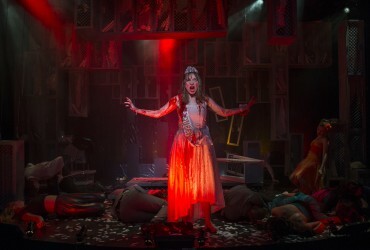 The Arts in Healthcare Minor is a popular minor with students majoring in various Theatre Department disciplines, including Acting and Musical Theatre, as well as with students majoring in other programs in Columbia College Chicago’s School of Fine and Performing Arts. This minor also serves as a foundation for those seeking master’s degrees in the creative arts therapies, such as dance/movement therapy, drama therapy and music therapy. 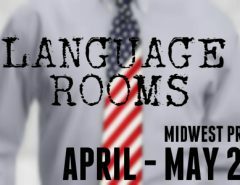 The conference takes place Saturday and Sunday, May 2 and 3, at Columbia College Chicago’s 916 S. Wabash building. Cost is $50 for students and $60 for professionals. Students, prospective students, and professionals in the performing and creative arts therapies fields are welcome. For registration information, click here.